Come enjoy this historic property which was established in the late 1800's. The beauty of this property is one thing, but as they say...location location location. The property is located in the Historic District Downtown SLO (many make this claim, but...) and only a brief 8 min stroll to downtown shopping, restaurants, the SLO Mission, and the renowned SLO Farmers Market. 3 miles from the SLO Airport, 0.5 miles from the Train Station. Both are under a 10 min ride with Uber. Along with the proximity to downtown and all it has to offer, Avila Beach and SLO county's coast line are a short drive away. Cal Poly is a short distance away as well. There isn't much that is over 10 min in this town when you stay at the Erickson property. Madonna Mountain hiking and biking trail head is approx 0.5 miles from the property and offers an outstanding outdoor adventure and world class 360 degree views from the top. One of SLO's fun sandwhich shops, High Street Deli, is right around the corner for a quick sando and sometimes live music in the warmer months. Morro Bay is a quick drive up Hwy 1 and if you are feeling like seeing some of the most serene coastline on the west coast continue driving north on Hwy 1 and experience: Cambria, Hearst Castle, Elephant Seals, Ragged Point, and even Big Sur. The coastline on your Highway 1 drive is some of the most photographed coastline in the world while also being some of the most pure, untouched space left in the state. If you are feeling like a hike, like i mentioned before, Madonna Mountain is close by as well as Bishop's Peak. Both are part of the 7 Sisters Peaks in SLO. If you are looking to stretch the legs and hike/bike on the coast, Montana de Oro is also amazing. While out there, enjoy a picnic at Spooner's Cove or hike/surf the Sand Dunes in Los Osos. The options are endless, precisely why I relocated here nearly 25 years ago. This cottage is equipped with many of the usuals: living area, full kitchen (for those who prefer home cooking), full bathroom, and loft which is the one bedroom. The second bed is a sleeper sofa and, might i add, very comfy. Not the old style where you feel every part of the frame through the night. The key is in a lockbox and ready for your checkin with or without seeing or meeting the owners. 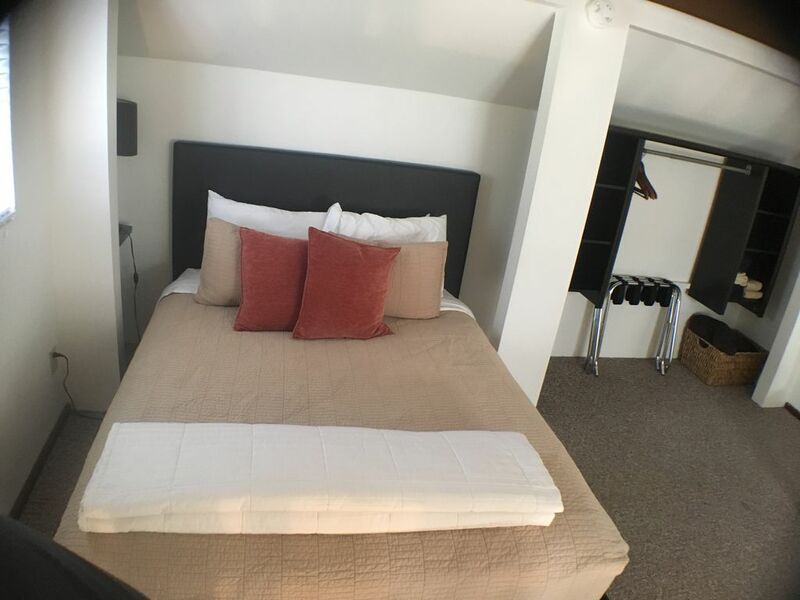 This cottage also has the amenities many have come to expect when renting via VRBO: cable tv, wireless internet, dishes, cooking utensils, furniture, linenes, towels, etc. A quick note: no pets and absolutely NO SMOKING ON THE PROPERTY. Both are in consideration for future folks who come to enjoy this property. Also, downtown SLO provides an excellent venue for parties and gatherings; we'd prefer they didn't happen at this condo. Downtown SLO is a short walk and a great place to let your hair down at night. We look forward to having you as a guest, only wish for your safe travels, and your experiences be memorable when staying with us. Both, Jen and I, are local professionals who serve this community in the health care industry. We have recently married each other after years of dating and have moved to this wonderful property with our blended family. Very exciting place to live in San Luis Obispo due to the history of the home, the condition of the property, and the location. They say location, location, location. In this case, location is incredible, but the property is even better and makes for a wonderful experience. We are looking forward to having people from all over the world experience San Luis Obispo. Enjoy!!! Why this property, one glance and you'll know why. This property is truly a landmark in San Luis Obispo and rich with tradition and history. There have been only 4 families to live in this home since its inception in 1894. I continue to mention the location, but it truly is a diamond in this small town. Come and enjoy! The historic Ericson property is located in downtown San Luis Obispo. Literally, a stroll into town will take 8 minutes. On street parking only, there is no driveway parking available. This is a nice cozy place that served us well and met our needs. Great location for exploring the town and area. Scott was friendly, very helpful, and upbeat in manner. The space was great for the two of us! Perfect size, everything we needed in it! We loved our stay in SLO! Our hosts were so welcoming and the property was BEAUTIFUL! We loved our stay at Scott and Jen's place. The apartment was perfect, the bed was very comfortable, and the location was perfect. The grounds around the apartment are beautiful and create a serene and hospitable atmosphere. Loved it!! Scott and Jen have a beautiful property. Scott was very helpful with local recommendations and the pull out bed actually was comfortable. Loved the garden and the cats! Great property. Very nice accommodations. Love SLO. Well tended. Owners available but not evident. Very nicely done. Perfect location and great hosts! My daughter & I came for a visit to SLO and a tour of Cal Poly. We walked to Thursday night Farmer's Market, had an easy drive to downtown for dinner at Firestone and picked up delicious sandwiches from High St deli (around the corner) before we drove to Pismo Beach for a picnic. The bed and sofa sleeper were very comfy and the kitchen was well stocked. Super safe and lovely neighborhood in the happiest city around. Scott and Jen were friendly and very helpful and made our trip great!